This code example shows how to integrate BotDetect PHP Captcha validation and CodeIgniter form validation functionality. It uses the CodeIgniter Form helper and the Form Validation library. The brief example is based around a contact form which sends email if the user input is considered valid – a likely real world scenario for Captcha protection integration. In order to use the BotDetect CAPTCHA CodeIgniter Library, we have declared Captcha configuration which will be used when loading the library in ContactController. Detailed description of this approach is available in a BotDetect CodeIgniter 3 integration guide. The View part of this example is straightforward. We add input fields of supplied type and length. Our Captcha Html is placed above the form field designated for retyping in the characters from the Captcha image, and only shown if the user hasn't already solved the Captcha challenge. The Controller part of the example provides the necessary helpers and data for the View to use, adding Captcha validation functionality as outlined in the BotDetect CodeIgniter 3 integration guide. 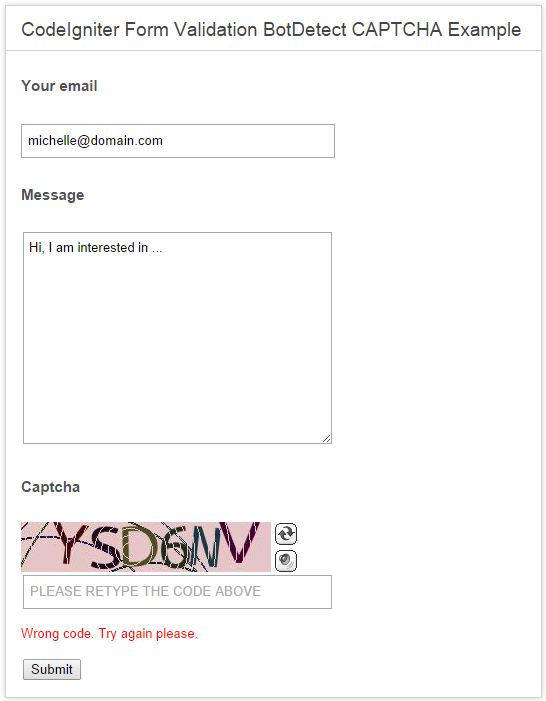 The Captcha library is loaded and provided with a unique ID and the name of the corresponding form field that the user enters the code into. Form helper is loaded and provides a way to compose the form in the View. The Form validation library is configured with validation rules for each field and supplied with a custom callback for the Captcha input field. The callback captcha_validate() wraps BotDetect Captcha validation calls and provides the result to the CodeIgniter Form Validation Library. The $_POST variable is checked to see if the form was submitted, in which case, the form validation runs. Note that the code does not display the Captcha if it was solved once and the other fields fail to validate. In case that the whole form, including the Captcha is considered valid, the code proceeds to compose and send a email using the CodeIgniter email library.